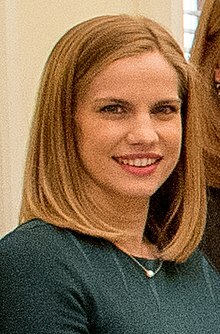 Anna M. Chlumsky (/ˈklʌmski/; born December 3, 1980) is an American actress. She began her career as a child actress, best known playing the lead role of Vada Sultenfuss in My Girl (1991) and its 1994 sequel. Between 1999 and 2005, Chlumsky's career entered a hiatus while she attended college. She returned to acting with roles in several independent films, including Blood Car (2007) and In the Loop (2009). Since 2012, Chlumsky has portrayed Amy Brookheimer on the HBO television series Veep, for which she has received five consecutive nominations for the Primetime Emmy Award for Outstanding Supporting Actress in a Comedy Series. Chlumsky was born in Chicago, Illinois, the daughter of Nancy (née Zuncic), a singer, actress, and former flight attendant, and Frank Chlumsky Jr., a chef and saxophone player. She was raised in a Roman Catholic family. Chlumsky is of Czech and Croatian descent. Chlumsky entered show business at an early age, modeling with her mother in an advertising campaign, though her roles in My Girl (1991) and My Girl 2 (1994) brought her fame. She also starred in Trading Mom (1994) alongside Sissy Spacek, as well as in Gold Diggers: The Secret of Bear Mountain (1995) with Christina Ricci. In the mid to late 1990s, she appeared or starred in several television films and series. Chlumsky attended the University of Chicago, graduating in 2002 with a BA in International Studies. After graduation she worked as a fact-checker for the Zagat Survey and served as an editorial assistant for a HarperCollins science fiction-fantasy imprint. She found this work unsatisfying and, after a chance meeting with Roberta Flack as well as other things she considered signs, decided to return to acting. She went to the Atlantic Acting School in Manhattan to receive formal training. Chlumsky appeared as Mary Calvin in a season 17 episode of Law & Order, first airing on January 12, 2007; and as Lisa Klein in a season 20 episode, first airing March 15, 2010. In March 2007, she appeared in the 30 Rock episode "The Fighting Irish" as Liz Lemler, a romantic rival of protagonist Liz Lemon, who receives flowers meant for Lemler. Chlumsky was in four episodes of the ABC dramedy Cupid in 2009. Later that year, she starred in the Lifetime Television movie 12 Men of Christmas as Jan Lucas. She starred in the Off Broadway production of Unconditional by Brett C. Leonard at The Public Theater, which opened on February 2008; it was produced by the LAByrinth Theater Company, She also starred in Lanford Wilson's Balm in Gilead in November 2005 at the American Theatre of Actors in New York City. In 2009 she appeared in Armando Iannucci's BBC Films political satire In The Loop, co-starring with Peter Capaldi, Tom Hollander, Chris Addison, James Gandolfini, and Mimi Kennedy, a quasi-spinoff of Iannucci's BBC TV series The Thick of It. She plays Liza, a State Department assistant in the movie. From 2012, Chlumsky has played Amy Brookheimer, aide to Julia Louis-Dreyfus's character in HBO's Veep, also produced by Iannucci. In June 2012, she starred in the world premiere of David Adjmi's 3C at the Rattlestick Playwrights Theater in New York. Dan Aykroyd, who played her father in the two My Girl films, has said that a script for a third film has been in development since 2003. In April 2012, Chlumsky "put to rest" any rumors that such a film was in development. In addition to her role on Veep, Chlumsky has appeared in multiple television series between 2011 and 2013, including White Collar, Law & Order: Special Victims Unit, and NBC's adaptation of Hannibal. Chlumsky has appeared on Broadway in You Can't Take It with You, and beginning in April 2015 as editor Iris Peabody in the comedy Living on Love, with Renee Fleming, Jerry O'Connell and Douglas Sills. In 2017, Chlumsky appeared in the fourth season of AMC Networks' Halt and Catch Fire as Dr. Katie Herman, the love interest of Gordon Clark (Scoot McNairy). In October 2007, Chlumsky announced her engagement to Chinese-American Army Reserve member Shaun So; the two had met as students at the University of Chicago in 2000. So was deployed to Afghanistan from 2004 to 2006. They married on March 8, 2008, in Brooklyn, New York, and have two daughters, born July 2013and August 2016. In 2017 during an interview in RuPaul: What's The Tee? podcast, she stated that she has lived in Brazil and speaks fluent Brazilian Portuguese. 1998 Cupid Jill Episode: "Meat Market"
1998 Early Edition Megan Clark Episode: "Teen Angels"
2007 30 Rock Liz Lemler Episode: "The Fighting Irish"
2010 Covert Affairs Vivian Long Episode: "I Can't Quit You Baby"
2011 Lights Out Charlie Episodes: "Headgames", "The Shot"
2011 White Collar Agent Melissa Matthews Episodes: "Where There's a Will", "Countdown"
2012 Army Wives Jessica Anderson Episode: "Tough Love"
2012 Law & Order: Special Victims Unit Jocelyn Paley Episode: "Twenty-Five Acts"
^ a b "Anna Chlumsky Actor". TVGuide.com. Archived from the original on November 18, 2015. Retrieved August 21, 2017. ^ Profile, FilmReference.com; accessed May 14, 2014. ^ Obituary for Frank Chlumsky, Jr., legacy.com; accessed May 14, 2014. ^ Pearlman, Cindy (January 26, 1992). "The minors become a major force on the screen". Chicago Sun-Times. ^ Strasburger, Chantal (May 26, 2016). "It's Pronounced KLUM-ski". Sweet. Retrieved December 28, 2016. ^ "My Girl's Anna Chlumsky Engaged". PEOPLE.com. ^ The NBA on Christmas Day: Talking with Anna Chlumsky, allball.blogs.nba.com, December 18, 2014; accessed February 5, 2017. ^ Fallon, Kevin (June 23, 2016). "How Anna Chlumsky Became Veep's Secret Weapon". The Daily Beast. ^ Caro, Mark (May 19, 2010). "'My Girl' star Anna Chlumsky all grown up". Chicago Tribune. Retrieved 2011-01-20. ^ a b Staff. "Anna Chlumsky: Actress". IMDB.com. Amazon. Retrieved 21 June 2014. ^ "Anna Chlumsky to Star in Lanford Wilson's Balm in Gilead Off-B'way", broadway.com; accessed May 14, 2014. ^ "Chlumsky, Gandolfini in 'In The Loop'". Ew.com. 2008-05-01. Retrieved 2011-03-27. ^ Bentley, Jean (December 3, 2010). "Congress Bans Loud Commercials, 'Dora the Explorer' Actress Withdraws Lawsuit and More". TV Squad. AOL.com. Retrieved 2011-01-20. ^ "Dan Aykroyd Switches Gears and Starts Push for My Girl 3". ScrapeTV.com. Retrieved 2011-03-27. ^ "Anna Chlumsky Declines My Girl 3". YouTube. April 27, 2012. Retrieved 2015-09-06. ^ "Anna Chlumsky Cast in Season Four of AMC's "Halt And Catch Fire"". AMC Networks. 9 June 2017. ^ "My Girl's Anna Chlumsky Engaged". People. October 11, 2007. Archived from the original on March 29, 2011. Retrieved 2011-04-13. ^ Cooper, Gael Fashingbauer (October 24, 2014). "'Veep' star discusses struggles of life as a military girlfriend". TODAY.com. Retrieved 2017-05-29. ^ D'Zurilla, Christie (2016-08-26). "Anna Chlumsky welcomes her second daughter with husband Shaun So". Los Angeles Times. ISSN 0458-3035. Retrieved 2017-05-29. ^ Saad, Nardine (18 July 2013). "Anna Chlumsky of 'Veep' toasts Emmy nomination, 1-week-old baby girl". Los Angeles Times. Retrieved 21 October 2014. ^ Juneau, Jen; Jordan, Julia (August 26, 2016). "Anna Chlumsky Welcomes Daughter Clara Elizabeth". People. Retrieved November 23, 2016. ^ a b c d "2013-14 Season". ^ "Emmys 2017: Full List of Nominations". Variety. July 13, 2017. Retrieved August 21, 2017.